I think it’s a safe bet to assume all graduates of horticulture contemplate travelling abroad with their newly acquired skills and knowledge. Those that do rarely regret it. Whether they remain abroad or return home the exposure to different cultures, work practices and techniques always stand. A question I frequently ask horticultural professionals is the advice they would give to a graduate. While responses vary, they always include encouragement to travel. If I were to start again, it’s what I’d do. Declan Blackmore had a dream to travel. Having graduated from Kildalton in the late 80s, he sought opportunities abroad and leapt at a chance for an internship in the US. He never looked back, at least not in terms of returning home to work. 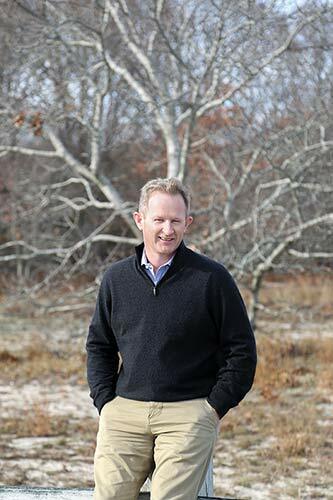 Now 30 years on, and Declan is president of Summerhill Landscapes Inc, one of the most successful landscape contracting companies operating in America’s most prestigious locations: the Hamptons. He may not have returned home, but he didn’t forget where he came from or how he personally benefited from the opportunity to travel. Once he established himself, he set about offering internships to international students. He is committed to providing students with authentic and life-changing experiences, and many of those who took up the opportunity now find themselves in senior roles in the company. Declan Blackmore’s story is one of passion, drive, energy and persistence. It is the horticultural American dream. What motivated you to follow a career in horticulture? For as long as I can remember I assumed I would go into farming, our family farm business. I spent my childhood working on my family's 200 acre farm in Kilkenny. However, my elder brother, Brian, would be the one to take over the farm. Since I wanted to work outdoors with the land, I chose horticulture because there were more opportunities in that field for someone without land. And since I'd always had a keen interest in gardening, combined with working outdoors, I chose to attend horticulture college at Kildalton College in 1986. How did you pursue your career after completing your formal education at Kildalton College? I actually started pursuing my career while still attending Kildalton College. Their approach meant going out and working in the industry for a year as part of the training. In December 1987, I saw an advertisement for an internship in America. The notice informed that there would be interviews for the opportunity to work with the Lynch Family in the Hamptons. I grabbed a bus from Waterford to Cork on Friday evening in preparation for my interview on Saturday morning. I didn't think I was going to get the internship, but Monday morning I received the call that I was successful and four months later I was working in America. What provided the impetus for you to emigrate to the US? At the time, there was a program called the Donnelly Green Card Lottery Program. I submitted 500 applications to Washington and was successful in obtaining my green card. I continued to work in the landscape industry for four years before creating Summerhill Landscapes Inc in 1993. We presently employ a staff of 125 at the height of the season and are one of the East End's leading landscape companies. My modus operandi has always been clear, to be the best in my industry, the attention to detail guy of a boutique landscape company. I am proud to have Brendan O Dwyer from Limerick (20 years served to date) and Edward Corcoran from Cork (12 years served to date) who came through the internship program and are now active partners and play a huge part in operations and management of the company. I think my Irish heritage and strong interpersonal skills have gone a long way in growing my business. Can you describe your average daily routine? This has changed drastically over the years. As we've become larger, my responsibility has increasingly been in sales, marketing and building relationships with Landscape Architects, builders, contractors, etc. My qualified staff handle the day to day operations very well. I try to visit as many job sites as possible in any given day for quality control purposes, but my biggest responsibility is in opening new doors and developing strong working relationships with Landscape Architects, some of whom are Christopher LaGuardia FASLA, Edmund Hollander FASLA, Andrea Cochran FASLA, Piet Oudolf, Margie Ruddick ASLA, and David Kelly ASLA. What type of projects does Summerhill Landscapes focus on? 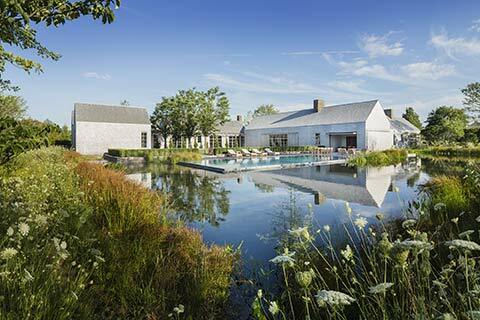 We generally focus on the high end projects in the Hamptons, where any request is possible. Some projects have taken up to two years to complete. On completion, Brendan and his talented team will prepare a complex maintenance package for the new landscape and develop the flower and vegetable gardens further with the new clients. Eddie, the construction team and myself will move onto the next install project. Spring can be overwhelming trying to get projects completed and get clients into their houses for Memorial Day and Fourth of July holiday weekends. While contracting is viewed as a demanding job with little thanks, it does have some rewards. What would you consider to be the most rewarding aspects of your work? The Landscape Architects are always aiming for the awards in the architect rural design magazines, so joining in their success if we are part of the project can be rewarding. 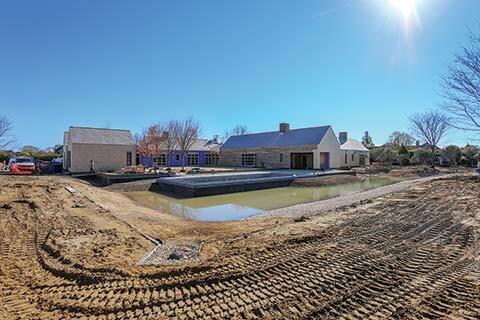 Winning a competitive bid on a large landscape project is always a good day’s work for me. Finally, rolling out the green carpet for a client who has been walking in mud for many months during house construction and seeing their exhausted facial expression transform into a happy smile is always gratifying for the team and myself. Conversely, what do you consider to be the most demanding parts of the work? Unrealistic client expectations and time management. If the client has been misinformed with unrealistic expectations by an Architect or designer, it can be very challenging to meet their expectations. Good time management is the shortest route to efficiency and productivity in my opinion. There is little to no regulation of the landscape construction sector in Ireland, something which has undermined both the quality of works being completed and also the public perception of the sector. What level of regulation do you operate within and how is it manifest? There are a lot of regulations in the East End of Long Island. It is an environmentally protected place where all development projects carry hallmarked regulations including stringent protection of the local water table, due to the fact that we are an island with a sandy soil. Stormwater management, wetlands protection, clearing restrictions on a new construction site, chemical use reported and nematodes control are all areas that must be compliant with local town and village code. The towns and village have a code enforcement team to inspect and enforce that the contractors and homeowners are in compliances with the local codes. While landscape contracts exist, they are typically only used for commercial work in Ireland. The use of contracts in domestic projects remains the exception rather than the norm. At what level are contracts employed in your business? Summerhill Landscapes will not start any project without an executed contract to protect both parties. Grey areas create problems, but black and white minimises issues. Not sure if the good old handshake would work in the Hamptons. Our contracts are all carefully reviewed and approved by a labour attorney. The Association of Landscape Contractors of Ireland (ALCI) is Ireland’s professional body representing the contracting community. In the absence of the government regulations, they work tirelessly to raise the standard and profile of the sector. Are you a member of a professional body and if so what function do they perform? Summerhill is actively involved in the Southampton Business Alliance and the Easthampton Business Alliance group, the NSLA (Nassau Suffolk Landscape Association) and The Farm Bureau Group. All of these groups actively represents the agriculture and horticulture sectors against new code change and regulations. I am also a member and a supporter of the following: the American Society of Landscape Architects, the Southampton Historical Museum, the Easthampton Historical Society, the Parrish Art Museum, the North Sea Citizen’s Advisory Council and a Friend of the High Line in New York City. We make every effort to give back, by performing community work or social work. I am not aggressive but I've built up enough of a name and infrastructure to be able to balance having a family and continuing to conduct business while allowing my two partners to continue to build and energise the business. If you were to wave a magic wand and change any aspects of the contracting sector in the US, what would it be? I would make the organic process of landscape and gardening mandatory. A recent wage survey conducted in Ireland showed that landscape operatives earn only just above the minimum wage. What sort of wage levels are obtainable in New York? I will never lose good talent over money. In the Hamptons, the starting rate is approx. $14-15 dollars per hour (€13-14) and it goes up from there. There is a perception on this side of the water that workers in the US have few rights, limited holidays and that it's pretty much a dog eat dog place to make a living. What has your experience been? As a product of the internship program and now an employer to many, the US offers so much opportunity if one works hard and has a dream. I agree that the pace in New York is fast and furious and not for everyone. Our teams arrive in our operational yards at 6:15am and must have all trucks loaded and on the road by 7am. We have staff who have been with us for 10-15 years and seem to be content. You offer a unique mentoring and internship program for international applicants. Can you explain a little about why you developed it and how it has evolved over the years? Again, my partner and I am the product of an internship from Ireland to Southampton, New York, and I want to share my story and experience with horticultural interns from all over the world. If I can inspire, mentor and teach a young horticulturist with some wisdom, knowledge and direction in their future to explore the possibilities of their potential, isn't that amazing? If I can play a minute part in their future success, that is truly gratifying. We started the internship program 20 years ago with Brendan O’Dwyer and now we bring 12-15 interns every year. While an intern is with Summerhill Landscapes, I want them to have an experience that will stay with them for the rest of their lives. I want each and every one of them to exceed their expectations in their careers. I encourage, mentor and help them to achieve their maximum capabilities. I presently have approximately 20 people in upper middle management who all started in the internship program. I want to give a shout out to Mike O’Keeffe and his amazing staff who work so hard to keep these programs going in challenging times. Summerhill is honoured to have been part of the internship program for 20 years and will continue to support and promote it for the next 20 years. What advice would you give to a horticulture student wishing to pursue a career in landscape construction? Follow your dreams, set high goals and don't fear failure as some of the most successful people in the world failed before they succeeded. I have found with a lot of Irish interns that they are more capable than confident. I encourage them to explore and find inspiration in other successful people. As a young man I was inspired by people who had wisdom and success. We are only waking up to the potential impacts of our influence on the environment and while it remains a low priority for many on the front lines of contracting, things are starting to change. How does the environment sensitivity play into your role? The East End of Long Island is a very unique environment protected by strict regulations and it is not only a place where pollution of all types is controlled, regulated and minimised, but the use of organic methods is encouraged, as is the recycling of landscape material like concrete and mulch. We live in interesting times, and living in the US you are at the epicentre. Do you see the changing political landscape impacting your business and if so, how? I am very fortunate to live in an economically protected bubble called the Hamptons. To a certain degree it’s a recession proof place, far removed from the real world. We are privileged that we work with a high end clientele and we have a product that is presently in demand. Summerhill has become a leading firm that holds a good market share in our demographic. How do you see your business evolving over the next decade? I hope to continue to cultivate slow, steady business growth through continual selectiveness on the projects we take. Maintaining good margins and constantly improving quality. Our European style seems to appeal to our clients. We launched a new exclusive all season high end flower garden service called Kathryn Flower Gardens in the spring of 2016. We acquired a 60 acre old tree farm and are in the process of rejuvenating it with new trees. Overall, we keep doing what we have been doing for the past 24 years. There is no landscape company in the East End that matches our percentage of horticulturalists and that injection of passion and knowledge is thanks to the agency in Ireland. Is the US home, and if so, what makes it home?